to Annelie Hendriks for her outstanding work. Ratana Keunkaew and Annelie Hendriks proudly hold on to their awards. 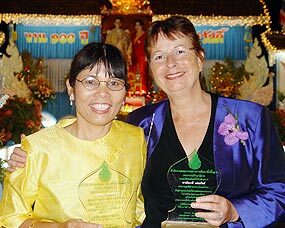 On 14 December 2007, Khunying Gasama Wotawan Na Ayuttaya, Secretary General of the Office of Basic Education Commission, Ministry of Education presented a Plaques of Honour to Annelie Hendriks and Ratana Keunkaew of The Samsara Foundation. The awards are in recognition of the work of Samsara Foundation in the 3 districts of Mae Lanoi, Mae Sariang and Sop Moei. In the last 4 years the foundation has built 31 dormitories, 17 canteens, 4 libraries, 14 toilet buildings and 8 water-collecting tanks. It has helped 65 poor mountain schools in the North of Thailand by providing furniture and educational equipment including school books. Without the assistance of the Foundation many children in these areas would be unable to go to school, because the children live too far away and especially during the wet season, daily travel is almost impossible. Samsara is also raising funds for scholarships to enable hill tribe children to get higher education. to bless the opening of the Shangri-La Hotel, Chiang Mai. 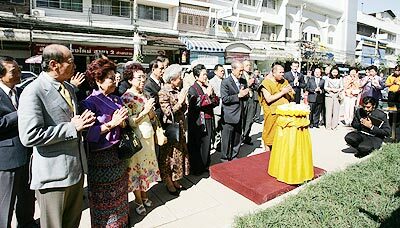 A ceremony was held on 22 December 2007 at Shangri-La Hotel, Chiang Mai to celebrate the soft opening of the Shangri-La Hotels and Resorts group’s second hotel in Thailand. Officiating at the ceremony was by Mr. Pong Sarasin, chairman of Shangri-La Hotel Public Company Limited, Thailand. Board members, owners and officers from Shangri-La Hotel International Management, Hong Kong and Shangri-La Hotel Public Company Limited, Thailand, high-level government officials and other VIP guests gathered to celebrate the opening of Chiang Mai’s newest luxury hotel. Philip Dailey, (right) general manager of the hotel welcomes the very first guests, Khun Kong and Khun Kamolthip Limkool with their two lovely daughters. The ceremony began at the auspicious time of 9.59 a.m. with religious rites performed by monks from Donchan Temple, followed by the unveiling of the outdoor signage for Shangri-La Hotel, Chiang Mai. Mr. Sarasin then struck a traditional Thai gong to symbolise the official opening of the hotel. Lunch was served in the hotel’s majestic Grand Lanna Ballroom. Also on this day, the hotel’s very first guests checked in. Khun Kong and Khun Kamolthip Limkool, and their two daughters arrived just before 10 a.m. Mr. Philip Dailey, general manager of the hotel, greeted them on arrival with a large bouquet of flowers before a souvenir photo of the family was taken. They were very honoured and impressed with the warm welcome. To mark this momentous occasion, a special opening offer starting from US$270 for a stay in a deluxe room, inclusive of buffet breakfast, is available until February 2008. Guests are also invited to celebrate the festive season at Kad Kafe, where special introductory prices are available this Christmas and New Year. Along with the renowned Shangri-La hospitality, various services, facilities and amenities, Shangri-La Hotel, Chiang Mai offers 281 guestrooms, and four food and beverage outlets. With up to 3,500 square metres of meeting and event space, the hotel’s function rooms provide unlimited possibilities for various events and can easily accommodate a banquet or event for up to 1,700 guests. Shangri-La Hotel, Chiang Mai is positioned as a deluxe city resort, complementing its sister property, Shangri-La Hotel, Bangkok. Its design and architecture are influenced by the city’s 700-year history and strong cultural heritage, and a “Lanna Renaissance” theme is highlighted throughout its facilities. The new hotel is located in the heart of Chiang Mai on Chang Klan Road, a convenient 10-minute drive from the domestic and international airports, and within walking distance of the city’s famous Night Bazaar. 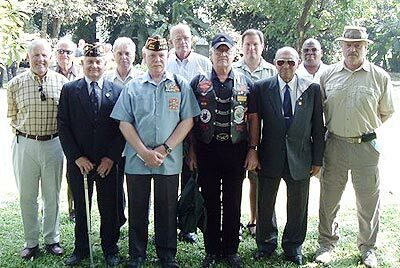 Members of the VFW Chiang Mai attending memorial services at the Foreign Cemetery in Chang Mai on the 11th hour of the 11th day of the 11th month. Jay Sapp and Vic Frappier. After many years of effort, we finally have approval for a Post of the American Veterans of Foreign Wars here in Chiang Mai. The Veterans of Foreign Wars is a not for profit American organization that is specifically Chartered to Assist Widows and Orphans of Members who pass away. In addition the VFW supports the community. 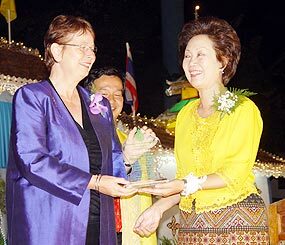 The ceremony for the initialization of our new Post is January 17, 2008 at the Grandview Hotel in Chiang Mai. We will start at 11:30 AM followed by a luncheon buffet. The American Chiang Mai Consulate General will be in attendance. The VFW has been around since 1899 with it’s beginning as a result of the Spanish American War where Veterans decided to “take care of their own” and lobby the US Government for better benefits for former US Military Veterans. To be a member a person must have served in a War or recognized conflict such as the Korean War or the Vietnam War. Should you like any further information we do have a website www.vfw-chiangmai .org and you may visit the National VFW website in the US at www.vfw.org . Even if you are not one of the millions who have helped make Rak Hang Siam a smash hit and its soundtrack the number one selling CD, you will surely know that this is a movie about love. Not the kind cynically celebrated by Cole Porter in Love for Sale, but in its gentler aspects. No bar boys or girls intrude here. This is about puppy love, teenage love, gay and heterosexual love, love of friends and family, love of music and love of God above all life. It is also about lost love. It is a movie that wears its heart so blatantly on its sleeve that the hard of heart may find it played at too emotional a pitch and think that the young musician hero, Mew, is in the words of the song, “Falling in love with love”. And make believe. (13 Beloved) for creating a breakthrough movie that looks at aspects of Thai life and culture in ways seldom hinted at previously. The theme is universal, the tone indigenously Thai and if international success follows it will be because of that. Its message is as clear as the Beatles’ photograph that adorns Mew’s wall, endorsing as it does one of their most famous lyrics, love is all you need. In a key scene the boy-band August are advised by their producer to broaden their appeal, “Over 95 per cent of chart toppers are love songs”, he adds. Mew their leader and composer is at a loss how to begin. The Love of Siam opens with a long pre-credit sequence where we see Mew as an only child, living with his grandmother. His (widowed?) father has left them and Bangkok. Tong his neighbor is at the centre of a devout Catholic family, with a dominating mother, a weak father and an older sister, desperate for independence from the claustrophobic household. When she mysteriously disappears in the jungle north of Chiang Mai, the shattered father turns to drink and they decide to move away, leaving Mew distraught at the prospect of losing his only friend. When his grandmother dies he is alone except for his music. After rejecting the suggestion by his infatuated neighbor that she should be his girlfriend, Mew sits down to write the words and music demanded by his producer. He looks at the boyhood photographs of him and Tong and writes the first of several songs, which punctuate the movie like muffled explosions. Nowhere more so than when he previews one at a party and sings it directly to his funny valentine. Tong is over-awed by its emotional directness. Who wouldn’t be? It is the upturn to the melancholy scene between the youngsters when Mew recounts his desperate loneliness and the fear if loving someone again following he loss of his grandmother. If he never cares for anyone again, he won’t be hurt. Tong, wrestling with his own emotions, puts his arm around the vulnerable boy’s shoulder in a tender echo of the photographs taken five years before. His mother seeing it –like some of the audience – simply as a ‘gay’ kiss is mortified. She has lost a daughter, her husband is an alcoholic wreck and now she fears losing her son, without the prospect of a family: a disaster, not least in Asia. Her possessiveness leads her to confront Mew and he is bullied into not seeing his friend. The complicated plot unravels amidst the chaos in the family as the look alike June stands in for the missing daughter and we are left wondering whether she might actually be her. This subplot parallels the comings and goings of the band and the other youngsters at drinks parties, at school, in restaurants and around the city, climaxing with the public debut in August. Mew rejoins the group, having once again told his admirer that they can only be friends and Tong has finally told Donut that it is all over between them. He goes to the concert where a new song is once again performed as an open love letter. This time the outcome is different. Tong gives his friend a poignant Christmas gift, a part missing from an earlier present. He tells him that he cannot be his boyfriend adding, “But that doesn’t mean I don’t love you”. Mew has lost and found true love in the same instant. Audiences are left to interpret this and other scenes as they wish. Tong has already admitted that he lets people down, “because I don’t know what I am”. All he knows is that he must return to his family, the bedrock of his existence. How long before he too seeks independence? Unusually, the film questions what keeps Thai families together. Mew returns to his band and, as many observers have noted, returns to the person most supportive of him despite their problematic relationship. Even so the movie ends with Mew in tears. This is, after all, a film about teenage love. Importantly, it is also a film that dares to confront matters that are left unsaid in Thai society, with its conservatism and rules of propriety. This is the importance of a work that might have been inspired by Francis Coppola’s golden-hued teenage movie The Outsiders which has the same ability to convey emotion, joy and heartache. Coppola has never been shy of confrontation, something alien to Thais. But Sakweerakul subtly and intelligently undermines such reticence, confronting subjects such as domestic turmoil and overlaying them with sweetness. Even with sweetness to coat the bitter pill, none of this would be palatable without his skill, especially with actors. Sinjai Hongthai plays the often unsympathetic mother with radiant aplomb, recalling an earlier Sophia Loren. As for the young stars, theirs’ is a triumph of casting and talent. Mario Maure, a handsome look-krueng is already the heartthrob of young Thais of both sexes. In the less showy part he handles emotional scenes with Mew and with his friends and Donut with force and dignity. Witchwisit Hirunwongkul as Mew, conveys all the pain and anxious tenderness of a teenager tossed like a leaf at the mercy of the elements. They and the rest of the cast live their roles so convincingly that Rak Hang Siam emerges as not so much a feature film as a close up and personal portrait of Thai life. Rak Hang Siam is still on release in selected cinemas and will be released on DVD early in the year. The soundtrack album is currently a best seller.